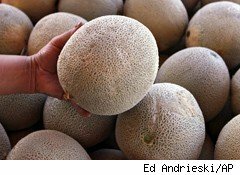 Listeria Scare Expands: On Thursday, Fresh Fruit Up Inc. of Depew, N.Y., became the latest company to recall cantaloupes possibly contaminated by listeria, but was acting "out of an abundance of caution," the Food and Drug Administration wrote on its website. The company recalled 4,800 packages of Fresh Fruit Cantaloupe and Cut Mixed Fruit Containing Cantaloupe. Although the melons originated from the same crop at Jensen Farms in Colorado that has been connected to 18 deaths, the FDA tried to allay fears by touting the packager's use of a potent sanitizing solution. The products in question were sold in the Buffalo, N.Y., area between Aug. 31 and Sept. 11. Initial symptoms from the bacteria take up to 70 days to appear, and include fever and diarrhea. Fresh Fruit Up said it did not hear of possible contamination until Sept. 27. No illnesses have been reported from this particular batch. The frail, the elderly, and pregnant women and their unborn children are most at risk of serious consequences or even death from listeria. The average age of those who have died during this food-borne outbreak -- the third most fatal since the Centers for Disease Control and Prevention began keeping records -- is 79. Wyoming has reported a 19th victim, but the CDC had yet to confirm it as of this writing, the IBTimes reported. The Fresh Fruit Up packages are labeled Cantaloupe Chunks, Cantaloupe Slices, Gourmet Fruit Salad, Small Fruit Salad, Small and Large Fruit Salad with Pineapple, Fruit Salad with Kiwi, and Fruit Trays. Consumers who purchased the cantaloupe can return it where they bought it for a refund, or destroy it. The company's consumer line is (716) 684-4300. VW Engine Trouble: A fuel injection system susceptible to fuel leaks has prompted Volkswagen (VLKAY) to recall 168,275 diesel engine cars. Affected models are 2009-2012 Jettas, 2010-2012 Golfs and 2010-2012 editions of Volkswagen-owned Audi A3s. The fuel-injection system feeding the 2-liter TDI diesel engines can develop cracks, leaking fuel that could catch fire, the Associated Press reported. The automaker told the National Highway Traffic Safety Administration that it was not aware of any safety-compromising incidents. The recall will begin in November. Volkswagen will fix the problems for free. IKEA Folding Tent Could Cut or Puncture: IKEA urged shoppers to return all BUSA children's folding tents for a full refund because the steel wire frame can break, causing lacerations with its sharp edges. The tent, which has been available at all IKEA stores since Aug. 1, has caused three known incidents, none serious, the company said on its website. The toll-free info number is (888) 966-4532. Faulty Drop-Side Rails on J.C. Penney Cribs: A Taiwanese manufacturer has recalled cribs sold at J.C. Penney (JCP) because their drop-side rails can suddenly detach, potentially causing infants to fall or get trapped under the railing. The Consumer Product Safety Commission said it was aware of nine incidents involving the cribs, none major. The Yu-Wei cribs were sold under the Scroll and Lauren brands and have model numbers 343-8225 (sold between 2006 and 2010) and 343-9117 (sold between 2007 and 2010). Around 8,000 cribs are affected. Consumers are advised to stop using the cribs and contact Yu Wei at (877) 806-8190 or yuweiparts@aol.com for a free immobilizer kit that will stabilize the drop side. The new ban on the sale of drop-side cribs was not in effect when the cribs were purchased.